Hi! I’m Trilly. I do product stuff at NHS Digital. You can find me on Medium, Twitter or LinkedIn. Here's a CV, if that's what you're into. I've documented some (unfinished) thoughts on my first Service Design in Government experience here. 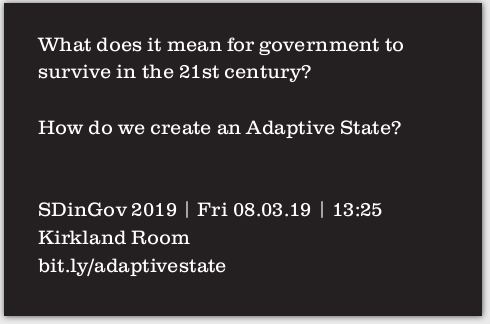 Below is the hour-long talk I did at Service Design in Government 2019. UPDATE 13.03.19: Around 11:40 in the video, I discuss the complexities of 'breaking up Facebook' (largely from a UK perspective). The same day, Elizabeth Warren publishes an outline proposal for how to do just that. Pending more detailed scrutiny of her proposals, I'm fully prepared to #standcorrected on this one. I'll try and post a transcript when I have a bit of time.